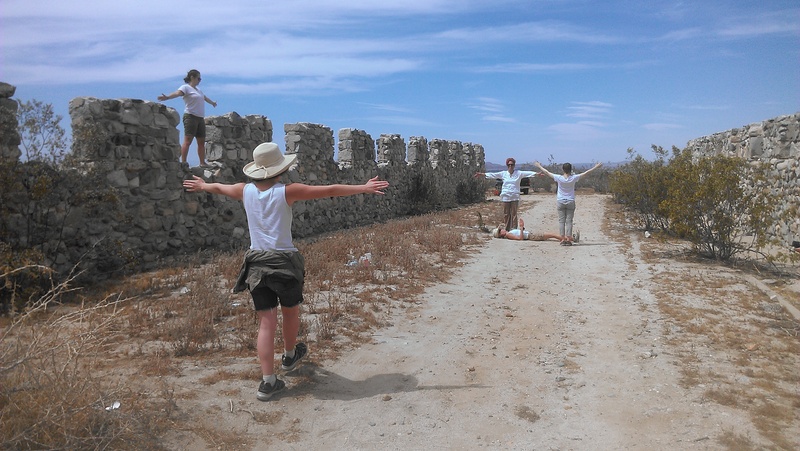 The dance group Opera del Espacio creates a real-time, architecturally inspired movement-based performance that interacts with the ruins of Llano Del Rio. On May 1, 1914, the Socialist colony of Llano Del Rio was founded in the Antelope Valley, about 70 miles northeast of Los Angeles, in the southern edge of the Mojave Desert. It lasted about three and half years, and at its peak over a thousand people lived there. On a recent weekend, a couple dozen Southern California artists paid tribute to the centennial of this experiment in communal living with a project called “Squaring the Circle.” The day-long event included film screenings, performance art, and music. 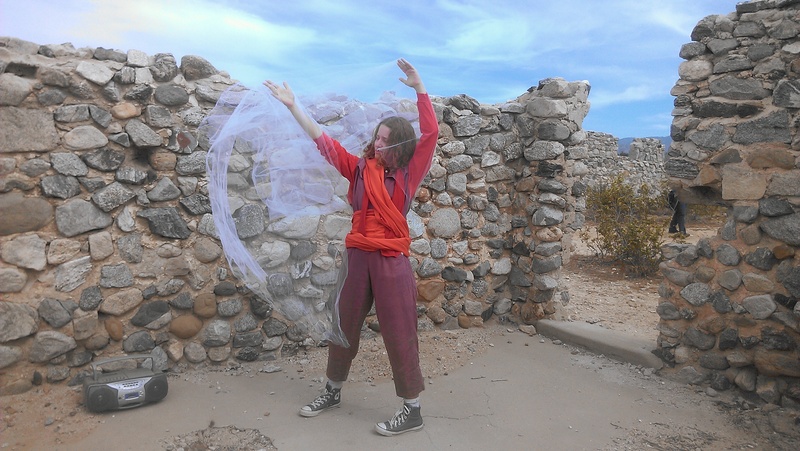 Dance theater artist Christine Suarez performs “Mother.Work” in the stone ruins of what was once a house at Llano Del Rio. She slowly swayed a thin veil of white tulle around her, letting the wind of the sparse landscape act as her collaborator. Meanwhile Alexx Shilling read from a letter written by a Llano settler, which Suarez adapted for the performance. 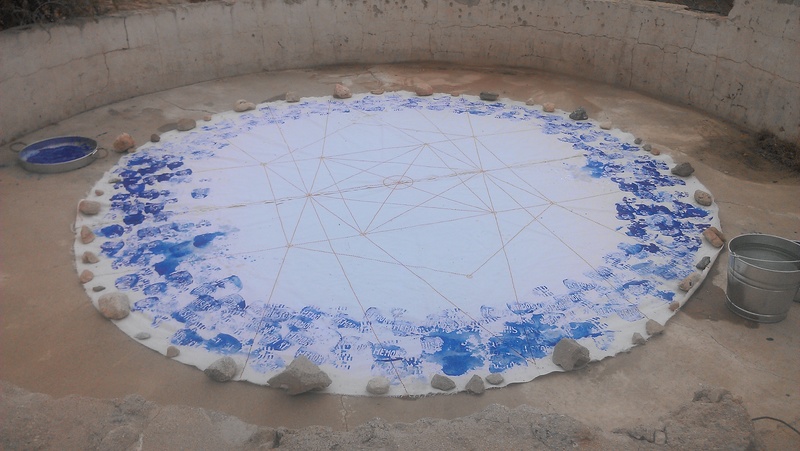 One of the artists, Christine Suarez, danced in the stone ruins of what was once a house. She slowly swayed a thin veil of white tulle around her, as her collaborator, Alexx Shilling, read from a letter written by a Llano settler. Suarez adapted some of the letters based on research and correspondence she discovered. Several participants grab colorful ribbons and dance in circles around a maypole, weaving the fabric into a tight pattern. Artist Leora Wien said the maypole was inspired by the May Day festivities that were celebrated at Llano Del Rio. Artist Leora Wien re-imagined a May Day ceremony by installing a maypole. 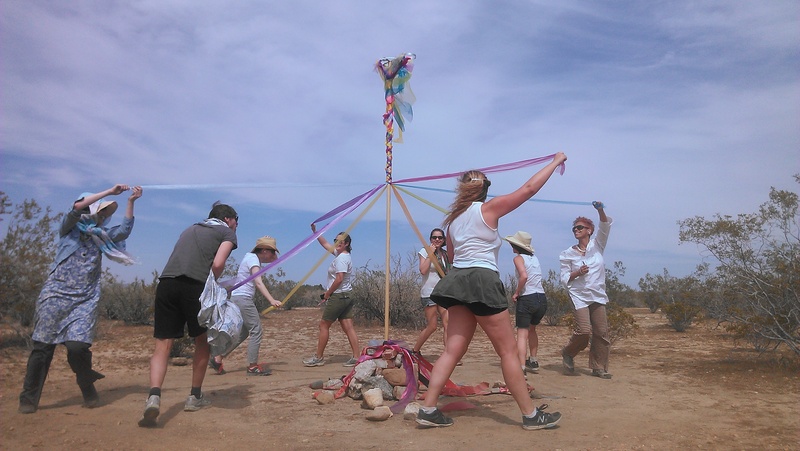 Several participants grabbed colorful ribbons and danced in circles around the pole, weaving the fabric into a tight pattern. Job Harriman, a lawyer and Socialist leader, was the founder of Llano Del Rio. In 1900 he ran for Vice President of the United States along with Eugene Debs on the Socialist Party of America ticket. He later ran for Los Angeles mayor twice, but lost because he defended the widely reviled McNamara Brothers, the union activists who pleaded guilty to bombing the Los Angeles Times building in 1910, which killed 21 people. After his narrow defeat, Harriman convinced members of the Young People’s Socialist League, or YPSLs, and other progressives and farmers to start a self-sufficient community in the desert. 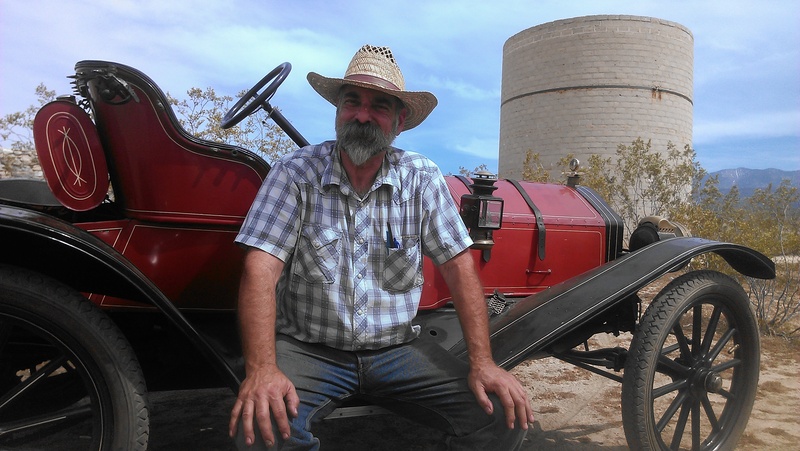 Historian Paul Greenstein rests on a 1913 Metz roadster, the kind of car that might have been driven at Llano Del Rio. Greenstein co-wrote “Bread & Hyacinths: The Rise and Fall of Utopian Los Angeles,” a book about Llano Del Rio. At the time, the average wage for skilled labor was $2.50 a day, and workers labored 10 hours a day, 6 days a week. Llano Del Rio promised better wages and working conditions – $4.00 a day, 8 hours a day, 5 days a week. “That was kind of revolutionary,” said historian Paul Greenstein. He co-wrote “Bread & Hyacinths: The Rise and Fall of Utopian Los Angeles,” a book about Llano Del Rio. Llano settlers built a printing press, planted fruit orchards, alfalfa and raised dairy cows, chickens and rabbits. There was even a fish hatchery. But it wasn’t all hard work. Elizabeth Leister stitched the city plan designed by Alice Constance Austin into this circular piece of canvas. She then put on two boots, with the words “History” and “Memory” carved into the soles, and walked in circles along the perimeter of the canvas, splashing water from a bucket as she walked. The piece reflects the idea of repetition without progress, as well as the failure of the Llano project. For the “Squaring the Circle” event, Greenstein set up a canvas tent, much like those the Llano inhabitants lived in, and displayed old photographs and copies of “The Western Comrade,” a Socialist newspaper edited by Harriman. Greenstein also brought along a wax cylinder player, a model that would’ve been used a hundred years ago. And he brought a working 1913 Metz roadster, and offered people rides around the site. Having a car would’ve come in handy at Llano Del Rio. The colony was spread out over several miles, with plans for further expansion. Founder Job Harriman tapped a radical feminist architect named Alice Constance Austin to design the city. Austin’s plans were never carried out. The community rejected what they saw as concrete prison-like buildings. Instead they lived in tents or adobe houses, most of which were destroyed by storms, leaving only the remains of a cistern, a hotel, a dairy farm and a grain silo. That’s where electronic artist Stephen Fiche performed this concert of echoing ambient music. 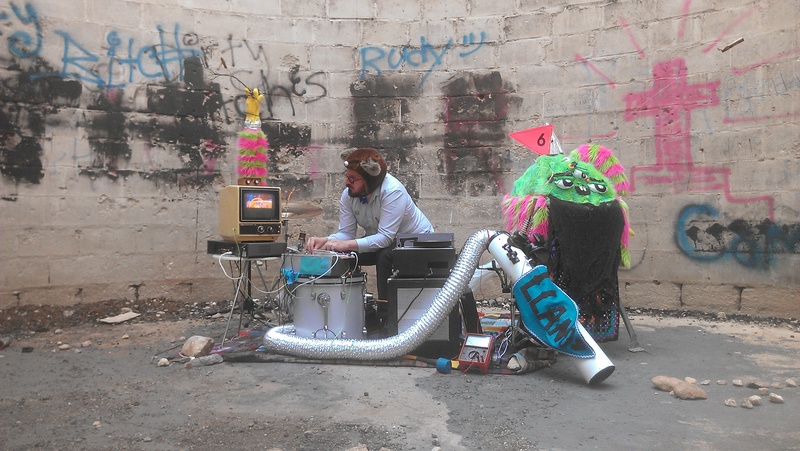 Electronic artist Stephen Fiche performed a concert of echoing ambient music, utilizing the cavernous acoustics of the grain silo at Llano Del Rio. Llano Del Rio declared bankruptcy in 1918. The commune folded for a few reasons. Internal strife over the political structure of the colony. A lack of reliable water from Big Rock Creek, the stream that flowed from the San Gabriel Mountains to the colony. The outbreak of World War I meant young men from the colony were drafted, while good-paying work became available in Los Angeles. In 1918, some 60 families boarded a train to Louisiana and formed New Llano, which lived on for another 20 years. Which is a lot like Los Angeles today – a place where people still move to start over, pursue their dreams, and create a bit of paradise in the desert.